Wow! I use leather ALL the time. I would love to check this book out. thanks. The bracelet is kinda cute. 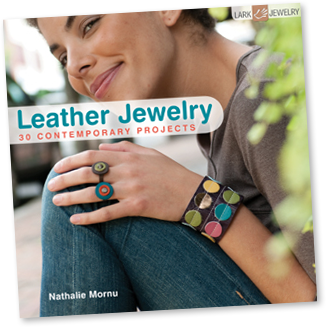 I've never thought about working with leather either but that book looks great! Cute! I was just stopping by to say that I nominated you for the Sunshine Award! Thats awesome ! I always thought about leather but I never know where to get it, or how much it would be. Thrifting for leather is an awesome idea ! hey there, I think your blog is totally amazing and beautiful, thats why I have nominated you for beautiful blog award.! That is sooo cool! I have a lot of leather and love to figure out how to use it... I actually find cutting a nice edge quite difficult! Why is leather ok, but most people are against fur? I've wondered that myself. Seems inconsistent, doesn't it? 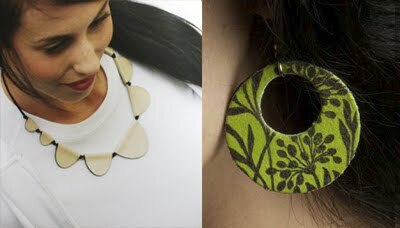 I'm sure GG can tell you that leather jewelry was "the thing' in the mid 60's through mid-70's. The years! Not our ages! I still have a few cool leather necklaces and bracelets from High School! I'd probably wear that bracelet and some of the earrings. Thats awesome ! I always thought about leather.